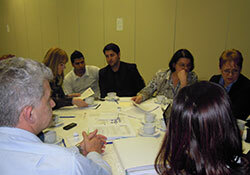 In preparation for the training in Skopje, a train-the-trainer piloting session was held on 7–8 November 2012 in Belgrade, Serbia, followed by in-country meetings in January and February 2013. “Achieving health equity is not possible without improving the living conditions of social groups that are experiencing poverty and social exclusion. One of these groups in Europe is the Roma. The conditions in which most Roma live seriously affect their health as do persistent inequities between Roma and majority populations, including in access to health care. Evidence clearly shows that socially excluded communities (including the Roma) lag far behind in most MDG areas, not least in the area of maternal and child health (MDG 4 and 5),” said Dr Piroska Östlin, Manager of the WHO/Europe’s Vulnerability and Health Programme. The training course participants learned how to use a practical tool, which consists of a methodological guide developed by the Spanish Ministry of Health, Social Services and Equality, for effective integration of equity into specific actions in relation to child and maternal health. Participants also had the opportunity to discuss with Andreas Tsolakis from the Fundaciόn Secretariado Gitano, Spain, the recently published European Commission report “What works for Roma inclusion in the European Union – policies and model approaches”, and to visit Europe’s largest Roma community in Shuto Oriza. “This training provided a good opportunity for Roma participants to learn together with the other participants how to tailor programmes that benefit Roma or other groups who face inequity. Working in this context makes it possible for unheard population groups to break barriers produced by prejudice and to bring to light the difficult situation that socially excluded groups face in daily life as a consequence of discrimination and the unequal distribution of the social determinants of health,” said Sebihana Skenderovska, representative of the National Roma Centrum in the former Yugoslav Republic of Macedonia. The training event was organized and facilitated by WHO/Europe in collaboration with the Interuniversity Institute for Social Development and Peace, University of Alicante (WHO Collaborating Centre on Social Inclusion and Health) and the Spanish Ministry of Health, Social Services and Equality. It was organized in the context of an interagency coordination initiative called "Scaling up action towards Millennium Development Goals 4 and 5 in the context of the Decade of Roma Inclusion and in support of National Roma Integration Strategies". WHO facilitates this initiative, which involves the United Nations Population Fund (UNFPA), Office of the High Commissioner for Human Rights (OHCHR), United Nations Development Programme (UNDP), United Nations Children’s Fund (UNICEF) and the International Organization for Migration (IOM).